It’s been 20 years since agronomists have developed fertilizer recommendations in Ohio. But now, Ohio State University Extension is embarking on a major initiative to determine the optimal rates of fertilization on the state’s major crops. The goal is to not only maximize farm profitability, but also contribute to improved nutrient management and water quality in the state. The Ohio State University On-farm Fertilizer Trials project plans to gather data from hundreds of farms statewide over the next two to three years, said Steve Culman, soil fertility specialist with the university’s College of Food, Agricultural, and Environmental Sciences and researcher with the college’s Ohio Agricultural Research and Development Center. OSU Extension is the outreach arm of the college. Similar projects are being conducted in Indiana and Michigan, and the results will replace the current tri-state fertilizer recommendations, he said. In Ohio, farmers will be paid up to $500 for participating, and crop consultants who join the effort will be paid $1,000-$1,500 for each trial they manage, Culman said. Ohio’s funding comes from the U.S. Department of Agriculture and commodity checkoff funds from the Ohio Soybean Council and the Ohio Corn and Small Grains Marketing Programs. “The fundamental question is agronomic,” Culman said. “Do we get a yield response to fertilizer application? Depending on the field, there is a lot of variability across the state. That requires a lot of different trials, documenting what we see with data. Organizers plan to gather data from corn, soybean and wheat farmers at planting, during the summer and at harvest. For each of the eight combinations of fertilizer applications they want to test, they hope to attract 30 farms to participate. Farmers can decide which type of nutrients they will test — nitrogen, phosphorus, potassium or sulfur, or a combination. Phosphorus especially has been linked with harmful algal blooms in Lake Erie and other bodies of water. Too much nitrogen entering lakes and streams can also cause serious environmental and human health issues. Sulfur, which is not used on a widespread basis as a fertilizer, is being included in the study because sulfur deposition into soils from the atmosphere has decreased substantially in recent years due to a shift from coal-based power, Culman said. “It is interesting because we never had to think or worry about sulfur in the soil before, but now people are looking at it more seriously,” he said. Applying gypsum to soil is one way to provide sulfur and is being promoted as a best management practice, Culman said. The product can be mined, but it’s also a byproduct of scrubbing sulfur dioxide from the gas emissions of coal-burning power plants. Farmers participating in the nitrogen trial will be paid a premium if they include testing strips without any applied nitrogen as one of the four treatments they undertake, Culman said. 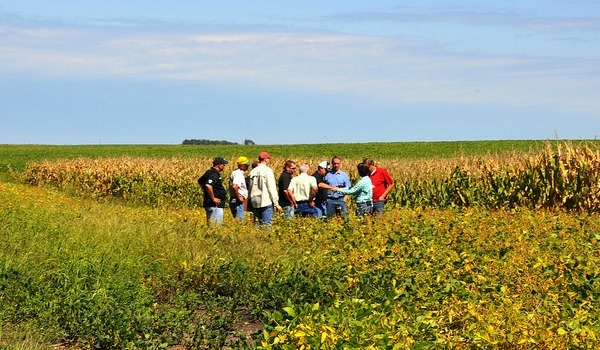 “Nitrogen is a really challenging nutrient to develop recommendations for,” he said. The soil itself can provide quite a bit of the nitrogen plants need, but it depends on a number of things: temperature, moisture, and the decomposition of the soil’s organic matter. “Last year, there was probably a lot of decomposition, but it got so wet that a lot of nitrogen was likely lost to the environment,” he said. “Nitrogen just doesn’t stick around. Its availability and loss is difficult to quantify, so it’s difficult to develop nitrogen application recommendations. But it’s likely the areas without any applied nitrogen will have lower yields, so the project will compensate farmers for that risk, Culman said. Ohio farmers and crop consultants can find more details at go.osu.edu/fert-trials, and may contact Culman at culman.2@osu.edu or 330-822-3787, or post-doctoral researcher Anthony Fulford at fulford.19@osu.edu. Besides being of interest to crop farmers statewide, results from this project will be used by researchers and Extension personnel involved with the university’s Field to Faucet water quality initiative, which is designed to ensure safe drinking water while keeping farms productive and profitable. Differences of opinion on proper fertilization rates are common, with some ag retailers recommending higher or lower rates than what’s in the 1995 guidelines, he said. “We as the land-grant university have the advantage of conducting these trials and gathering a good, robust data set so farmers know what the appropriate application rate really is,” Culman said. “Since fertilizer inputs are generally second only to seed as the largest costs farmers have, we can help farmers maximize profits by being as judicious as possible with fertilizer. This article was written by the College of Food, Agricultural and Environmental Sciences at Ohio State.